Works from over 20 Irish artists will be on display in the link corridor between Beaumont Hospital and the St Luke’s Radiation Oncology Centre. 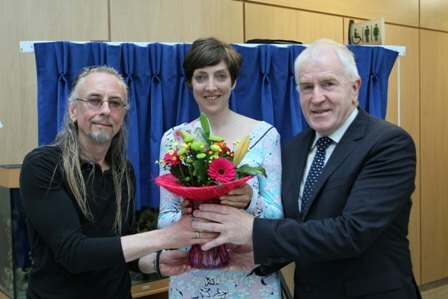 Today, (6th May 2014) a new contemporary art exhibition space called “Art Walk” ,for patients and visitors to Beaumont Hospital and St Luke’s Radiation Oncology Centre, was officially opened by Minister for Arts, Heritage and the Gaeltacht, Mr Jimmy Deenihan, TD and renowned Irish artist, Guggi. The Art Walk will display works from over twenty contemporary Irish artists transforming what was a functional link corridor between the two buildings, into a stimulating visual amenity. All works are available for purchase with twenty per cent of the sale of each artwork going directly to Beaumont Hospital Foundation and the Friends of St Luke’s. Artists exhibiting include Rod Coyne, Norman Teeling, Neal Greig, Maria Kilgallon, Paul Shane, Eileen McNulty and Paul Leech, several of whom attended the launch along with Sheila Pratschke, Chairwoman of the Arts Council. Irish artist Guggi said: “The Art Walk is not only showcasing pieces from over twenty Irish contemporary artists, all the works are also for sale with a percentage going directly to two important charities, Beaumont Hospital Foundation and Friends of St Luke’s. The works on display showcase a wide variety of techniques and talent . I would encourage members of the public to take the time to enjoy the fantastic works of contemporary art." Dr Susan O’Reilly, National Director, National Cancer Control Programme (NCCP) advised that the NCCP are delighted to be part of this opening and would like to thank the Friends of St Luke’s Cancer Care and the Beaumont Hospital Foundation for their support on this very worthwhile project. (l-r) Artists Guggi and Sheela McShane with Minister Deenihan.